Lucasfilm revealed the first image from The Mandalorian, the live-action streaming series set in the Star Wars universe, and announced an impressive list of directors who will help bring the series to life. The Mandalorian will tell the story of a lone gunfighter in the outer reaches of the galaxy far from the authority of the New Republic, as previously announced by producer Jon Favreau. That gunslinger will wear the iconic armor made famous by bounty hunter Boba Fett, as seen in the show’s first production photo. Additionally, Lucasfilm named five episodic directors who will join Favreau in creating the show. The lineup includes Deborah Chow, whose television credits include Jessica Jones, Mr. Robot and Reign; Rick Famuyiwa, whose films include Dope and Confirmation; Bryce Dallas Howard, the co-star of Jurassic World and the director of various short films; and Taika Waititi, who directed Marvel’s Thor: Ragnarok and What We Do in the Shadows. Dave Filoni, known for his work on Star Wars: The Clone Wars and Rebels, will direct The Mandalorian’s first episode. The series will be executive produced by Jon Favreau, Dave Filoni, Kathleen Kennedy and Colin Wilson, while Karen Gilchrist will serve as co-executive producer. Lucasfilm announced it was working on an original Star Wars television series earlier this year, with Favreau set to write and produce. 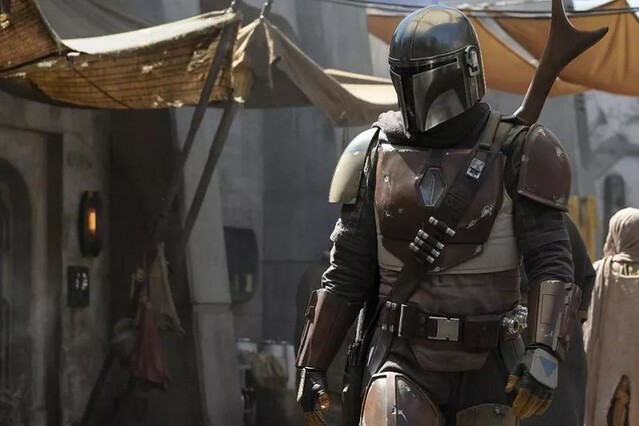 The Mandalorian will stream on Disney’s streaming service, which is set to launch in late 2019. How dare you sully the page with a link to Polygon! Looks interesting. I have faith in Jon Favreau to bring something good to the screen, let's remember he was, in large part, responsible for Iron Man and launching the MCU. A Star Wars with a western flair? I dunno if I care that much for the idea as much as I liked the idea as much as I liked the concept of 1313. I am not looking forward to the Disney streaming service; who knows how much this will cost considering the typical tax anything labeled "Disney" has attached. It means all the Marvel work will probably be stuffed in between Frozen and dozens of direct to DVD Disney Princess and Star Wars Ewok Christmas episodes. I wonder what happens to the Netflix and ABC Marvel shows. I loved that movie: "Captain Corellian's Mandalorian"
The only Mandalorian I care about is Michael J. Fox. Star Wars has always been a Western in space, with bonus space wizards for a Samurai movie flair. This will just be the most overt Western influence the series has had so far, which ain't a bad thing in my book. Favreau will deliver a solid series, I think. This should hopefully knock it out of the park. I will watch it. Based on the IP, it should have the same quality as Game of Thrones etc. If it does, it should be a hit. Hopefully there are alternative ways to watch it except a streaming service. I didn't really classify Star Wars as "western". I usually classified it more as Galactic Fantasy. Firefly is what comes to mind when I think space western, a Frontier filled with people that have pioneering spirit. Star Wars didn't seem like it was really at the "Frontier" stage. It was an old, explored universe. Similar to Battletech which, while it had the outer rim type planets, even those weren't exactly a "frontier" pioneering type environment. Either way, the only real choice for me is if I'm willing to pony up for yet another premium service to watch this show. If they release the whole series at once, ala Netflix I might sub for a month. This one show isn't enough Disney for me, an adult with no kids, to want a persistent service. I am not looking forward to the Disney streaming service; who knows how much this will cost considering the typical tax anything labeled "Disney" has attached. Disney claims it will be cheaper than Netflix. That would make sense, initially, as they want to attract as many subscribers as possible. Once they reach a certain number of subs, they'll jack up the price for sure. My problem with everyone trying to get their hand in the streaming service business, is that it's becoming like cable all over again. I'm gonna go back to pirating everything eventually because it's cheaper and far more convenient. I'm waiting for a streaming service to crop up that bundles other streaming services together under one handy, convenient monthly subscription. It'll essentially be the streaming version of a cable provider, which is deliciously ironic. Hmmm, I hope this Star Wars show has Jedi in it. The movies don't anymore. Fingers crossed, maybe he'll befriend one. Not going to happen again in our lifetimes. That's exactly what cable/satellite represented. That model is dying now because everyone and their brother wants the piece of the pie that they have to give to the digital storefront operator. Which is exactly why companies like EA and Ubi have set up their own digital storefronts. We're never going to have 'one ring to rule them all' again. I for one am more than happy with that. I haven't missed cable for a moment since I tossed it out of our house years and years ago. A couple of streaming services offers such a torrent of content I have no need of any more, and all the economic incentives now are in the 'create your own platform for content' category. I remember a time when most Star Wars media wasn't loaded with Jedi. I hope we don't see a single lightsaber in this show. You might not classify it as such, but there's no denying the influence Westerns had on Star Wars. It's a Western in space with Space Samurai Wizards. Firefly wears its influence on its sleeve. The first film was definitely a Space Western/Samurai film. The later films, as they expanded more into the universe, becomes more Space Frontier as things were shown to be more lawful and enhanced than the a New Hope had setup the universe.